Below you can find a list of some of the more common asked questions that you might find useful. At Namgrass we always say that there is no such thing as zero maintenance, especially in the garden. But Namgrass requires minimal maintenance. See our guide for more information about aftercare and maintenance. Can weed roots affect Namgrass? The composition of Namgrass consists of a very strong woven ‘scrim’, this coupled with the latex backing and our recommended weed membrane installed under the grass make for a very tough surface, and for any such issue to be minimal. How long can I expect my Namgrass lawn to last? The life expectancy of any artificial grass very much depends on its usage, at Namgrass we say that under a normal domestic/garden usage that the life expectancy of the grass should be between 15 to 20 years. All Namgrass products are produced in our very own factory in Belgium! Which Namgrass product is most suitable for pets? Namgrass is great for dogs and pets. Pet ‘mess’ will not affect Namgrass, nor will it discolour the grass. The installation process does differ slightly if you have pets, for example, we would recommend not installing shock pad or infilling with sand as this can hold moisture and therefore more likely to retain pet odours. We would also recommend a shorter pile height as its easier to clean. Your grass will need to be hosed down at least every 3-4 weeks. However, the frequency of this differs depending on the time of year and amount of use. Can I have a BBQ on my Namgrass lawn? All our Namgrass products are tested to determine fire behaviour to EN ISO 9239-1 standards. Should you wish to put a BBQ on or near artificial grass we would recommend standing it on hard standing for example, some slabs – just to avoid any damage being done to your grass. Does Namgrass really feel and look like the real thing? At Namgrass we are inspired by nature – and we believe our products not only offer the very best in terms of quality, but also offer the most natural look and feel. Our product range is designed to satisfy everyone’s needs i.e. light coloured grass, darker shades, long pile, short pile, no matter which product you choose you can be assured you are buying the very best product on the market. Can I install Namgrass myself? Yes you can! Follow our easy-to-follow steps in our installation video, as explained by property expert Sarah Beeney. Alternatively, we have a nationwide network of Namgrass approved installers who can install it for you. Why should I choose Namgrass over and above other artificial grass suppliers? At Namgrass we pride ourselves on being totally unique in the market place – for the very reason that we are the only supplier in the UK that designs, manufactures and distributes all of our own products. So what does this mean to you? Well, I means you get a far superior and unique product, unrivalled in terms of quality, looks and feel at a great price – in short, we offer far superior products, at the same price, or in some cases cheaper, than our competitors. I’ve ordered the wrong amount, can I order the same Namgrass after it’s been delivered? To ensure an absolutely perfect match of grass throughout your new lawn it is important to order all of the grass you need at the same time as colour and pile can vary slightly between different production batches. Because we make all of our own products, we offer our very own warranty across all our grasses. The main points this warranty covers are UV stabilisation (no fade), the integrity of our products and ‘rot’ i.e. our products will not rot after a couple of years. What is Namgrass made from? All Namgrass products are made from the highest quality materials. To view some information about the material used to make Namgrass, compared to some of our competitors, go to Why Namgrass. What direction shall I lay Namgrass? 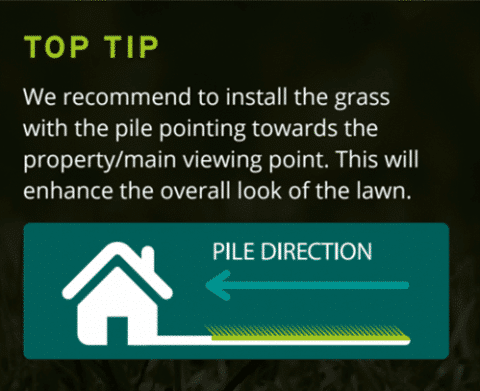 All artificial grass products have a ‘pile direction’ and when laid correctly helps your lawn look as natural as possible. The preferred way to lay Namgrass is with the pile facing towards the house. It is also important to note when joining two pieces together the pile direction must be in the same direction. I’ve noticed some fine white fibres, what are they? On the rare occasion, you may notice thin white fibres that appear in your artificial grass, please do not worry – this is simply a multifilament yarn that binds the grass fibres together and protects the fibres through the manufacturing process and will disappear on its own. On average, it takes a few months (and sun helps) however if it is taking longer please do give us a call. Thank you for choosing Namgrass! Don’t forget your product has a 10 year warranty. Register here to validate your warranty if you haven’t done so already.